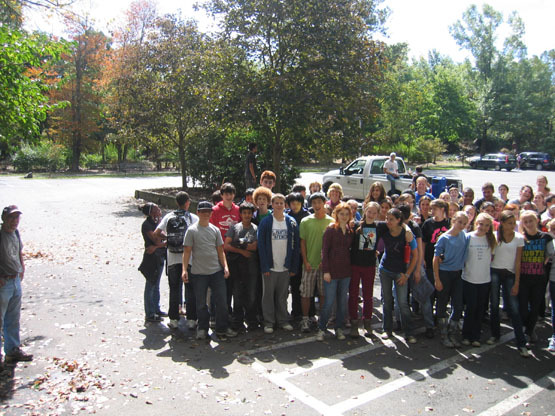 Early on the morning of September 17, some 100 freshmen and six teachers walked through the preserved woodlands that stretch from Princeton Day School to Community Park North. Their goal was to help clear invasive plants from the woods around the CP North parking lot, as part of PDS's community day. When they arrived, I told them about the work Friends of Princeton Open Space has done over 40 years to help preserve the lands they had just hiked through, and explained how habitat restoration can effectively increase the acreage of functional open space in town by shifting the plantlife to native species that wildlife prefer to eat. There were also some tool safety tips and warnings about poison ivy to impart. 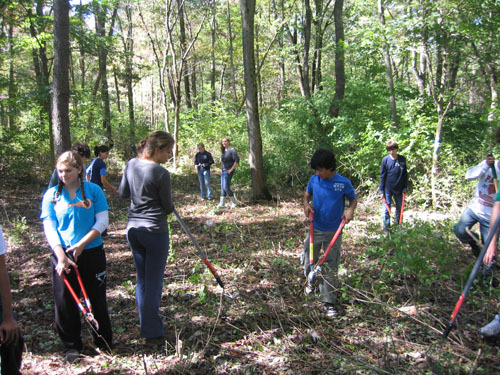 Armed with this knowledge, and a whole bunch of loppers and garden rakes provided by the school, the kids broke into six groups and took on the somewhat daunting task of clearing multiflora rose and other invasive exotic species from the woodland. Teamwork was emphasized, as one student would push the branches back with a garden rake so another could get underneath and cut the stems. 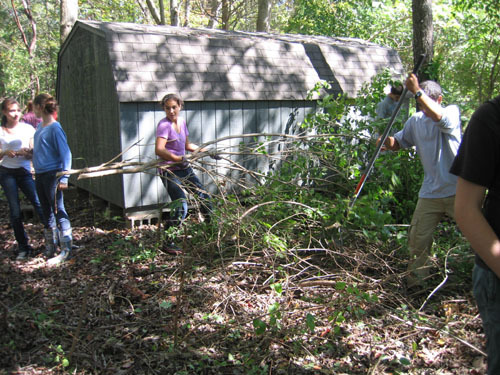 For me, the primary goals were for kids to learn how to use the tools safely, work together and gain some confidence in identifying shrubs like honeysuckle, privet and Asian photinia--the same sorts of weedy shrubs that likely grow along the fencelines around their homes. Any progress towards tipping the balance in the understory from exotic to native would be gravy. Turned out there was a lot of gravy, as the kids worked hard through a morning session, and even harder after lunch. 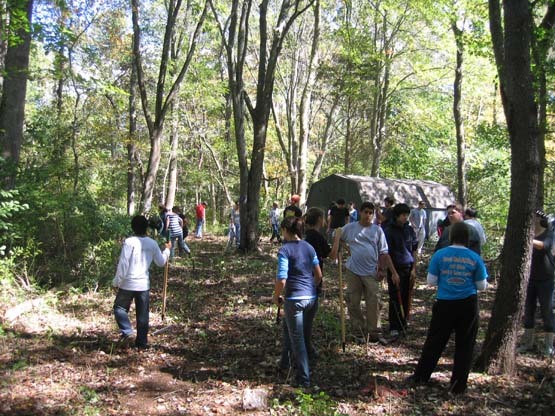 For the afternoon session, we took a teacher's advice and marked off sections of woods that each group was to clear before hiking back to school. 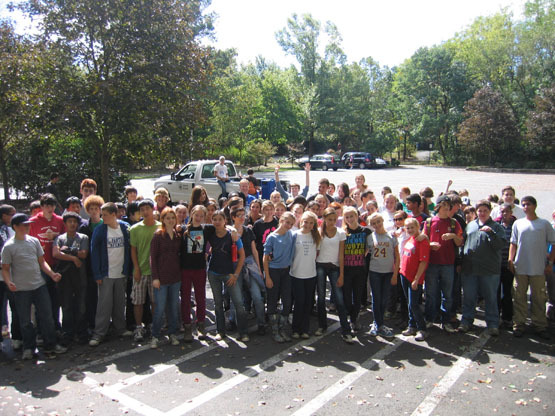 Seeing the boundary of their task, the kids worked harder, which for many led to the discovery that the hard work of land stewardship can have satisfactions beyond reaching the day's goal. 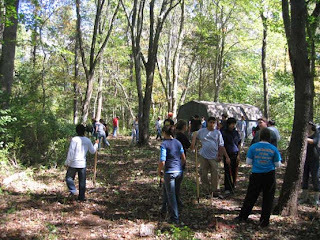 The result was a dramatic change in the landscape, new vistas and an opportunity for natives to repopulate the woods. Thanks to the freshmen students and teachers of Princeton Day School for all their help. And thanks also to my friends Andrew, Linda and Annarie for coming by to help supervise. Andrew Thornton recently showed me the new trail that he, Clark Lennon and Ted Thomas have been building along the Stonybrook. 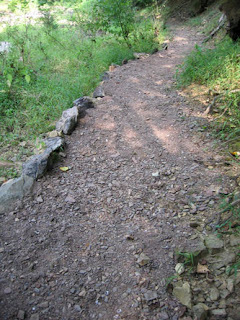 This is the trail that's part of a celebration this coming Sunday, to which all are invited (see other posts). One of the most striking features is the age and size of trees that grow in this rich Stonybrook floodplain, gaining more character with each passing year. There are impressive specimens of tulip poplars, red oaks, sycamore, shagbark hickory, and many other species, including a pecan tree leaning out over the stream. After a summer of drought, it's easy to step off the trail and take a look at the frogs, crawdads, fish and other critters eking out an existence in the brook. Fowlers Toads kept an eye on us throughout the walk. 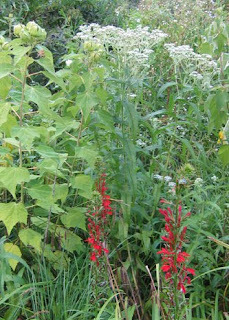 This photo tells the story of how reduced deer browsing pressure in Princeton Township has allowed the native plants to bounce back. 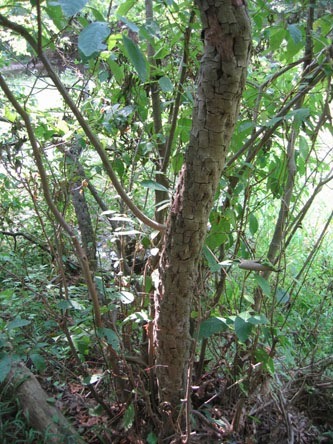 Ten years ago, when deer numbers were very high, many spicebush shrubs were barely hanging on, with only one stem high enough to avoid being eaten. 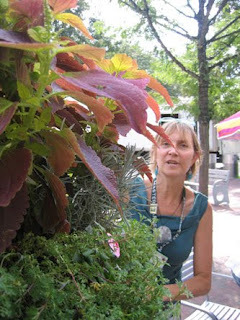 All new sprouts from the base would be browsed, preventing the bush from replacing the aging stem. 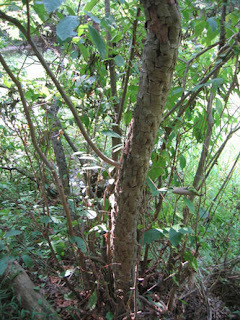 As deer numbers were brought down, the spicebush have successfully developed new trunks to replace their aging lifeline. Prosperous native shrubs mean more high-lipid berries for birds and leaves to meet the specific needs of various butterfly and moth species. 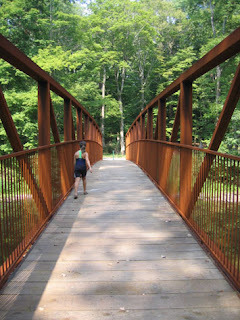 At the end of the trail, a lovely new bridge spans the Stonybrook. Though the bridge is the result of various grants, and cooperation and initiative shown by FOPOS, Princeton Township, D&R Greenway and others, to me it symbolizes the fruits of patience and perseverance, as exemplified by Princeton resident Helmut Schwab. Some years back, I would listen to Helmut's updates on the project at Friends of Princeton Open Space meetings, and wonder how he could possible keep going in the face of what seemed like insurmountable regulatory and bureaucratic obstacles. Now, my eyes have been opened. What a fine destination after such a long journey. Though I say the bridge is at the end of the trail, it is actually part of a circum-Princeton route that, with the building of this bridge, has come closer to realization. Responding to a groundswell of demand, here is a map of the new trail that starts at Greenway Meadows and heads downstream to the new bridge. As mentioned in a previous post, and on the fopos.org and drgreenway.org websites, the public is invited to a celebration of the completion of this trail and bridge this coming Sunday, beginning at 3pm. This section of trail is being, or by now has been, built by Andrew Thornton and Clark Lennon, with guidance from the FOPOS Trail Committee. You can click on the box with four arrows to make the map larger. 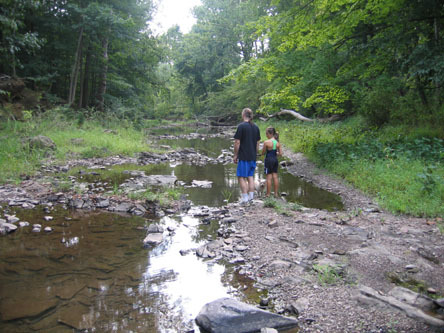 The Friends of Princeton Open Space and Princeton Township are inviting everyone to join in a celebration of a new trail and bridge along the Stonybrook. As part of the event, I'll be leading a walk from Greenway Meadows to the bridge at 3pm. More on the new trail in an upcoming post. Click on the little box with four arrows, just to the left of the "Download" box, to see the invitation full size. Now, that's strange. Seems to me there was a lake around here somewhere. The plug has been pulled, the 7 feet of fertile sediment accumulated over the past 100 years is being dug and hauled off to farms and topsoil makers, and the dam is being restored to its cerca 1900 appearance. 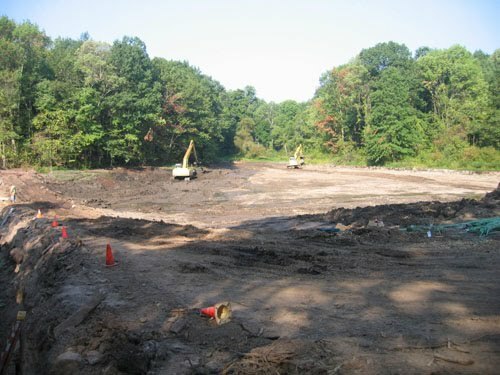 Given the highly conducive weather thus far, the contractor is hoping to complete restoration of the upper lake and dam by December. One of the streams that feeds the lakes enters back where the trees meet the mud in this photo, between the two backhoes. From an old aerial photo the engineers determined that the pond used to extend further up into that valley, and I was alerted that some more mud and associated plants would be coming out. 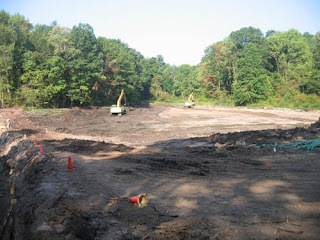 FOPOS board member Tim Patrick-Miller agreed to help me rescue some of the wetland species before the digging started. 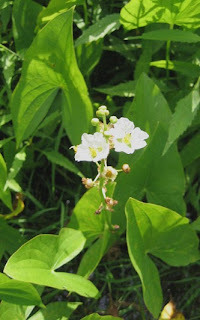 Much to my surprise, we found 4 species to add to the list of plants growing at Mountain Lakes. 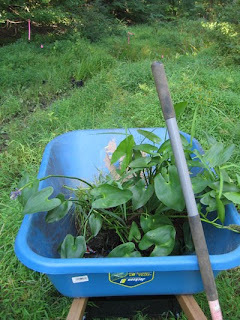 In the wheelbarrow (our manual labors contrasted comically with the big machinery of the dredging operation) is pickerel weed, which is rarely found growing in the wild in Princeton. It likes shallow standing water at pond's edge. Nearby was a little gravel streambed, away from the main current, that was clearly perfect habitat for three other species of plants also rarely encountered. This one, new to me, turned out to be ditch stonecrop. Not a pretty name, but it's true it was growing in something akin to a stony ditch. Water plantain has oval leaves and tiny white flowers. It also needs a very stable hydrology, quickly perishing for lack of water. Petals and branchings come in threes. 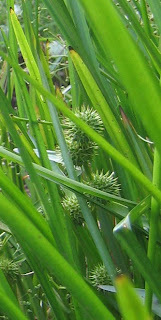 Bur Reed has leaves like an iris and seed capsules like those that fall from a sweet gum tree. All four of these species only survive in locations that stay consistently wet throughout the summer. 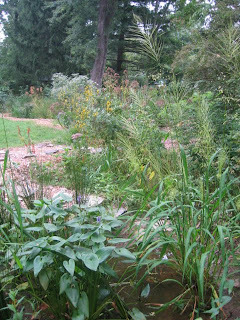 Though this continent once had abundant wetlands with much more stable hydrology, suggesting these plants were once abundant, the only places I find them now are in areas kept artificially wet, such as the edges of impoundments like Mountain Lakes, and the pump-enhanced marsh at Rogers Refuge. These are the two most common native shrubs found in Princeton's nature preserves. We call them native because they co-evolved on this continent for millenia with wildlife and other plants, and so have developed complex interactions that make for a stable, diverse ecosystem. Exotic shrubs introduced to this continent over the past few hundred years, by contrast, are still typically not eaten by the native wildlife, and so are not nearly as beneficial as native species are for habitat. 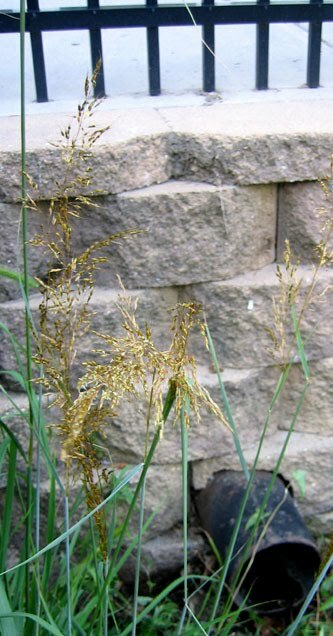 To see more photos and text about these species in Princeton, type the name of the plant into the search box at the upper left of this website. BLACKHAW VIBURNUM: Opposite branching, leaves roundish with slightly toothed margins and white central vein. Bark cobbled like flowering dogwood’s. In anticipation of 100 Princeton Day School 9th graders coming to Community Park North tomorrow morning to help remove invasive shrubs, I brought home some leaves of the various kinds of shrubs they will be encountering in the woods, and scanned them into my computer. 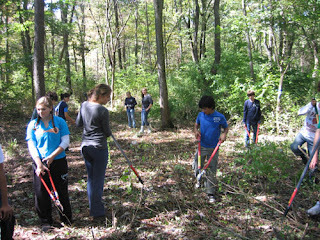 Below are the shrubs we'll be removing, along with some descriptions. 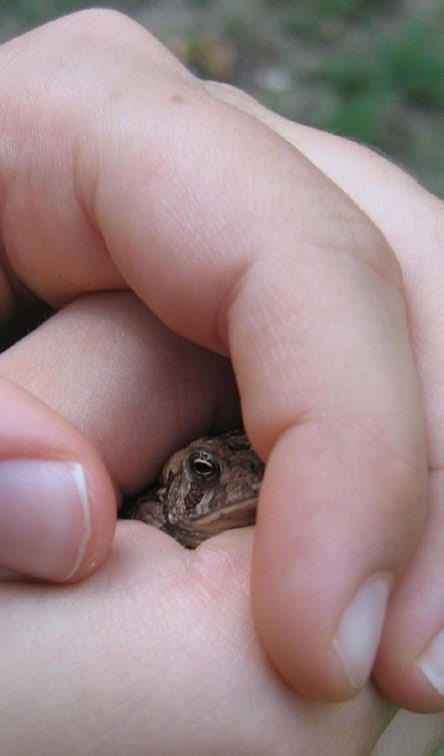 They are as common in people's backyards as they are in Princeton's nature preserves. 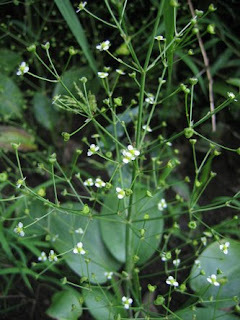 To see more photos and text about these species in Princeton, type the name of the plant into the search box at the upper left of this website. MULTIFLORA ROSE: Sharp thorns curved backwards. Alternative leaves. 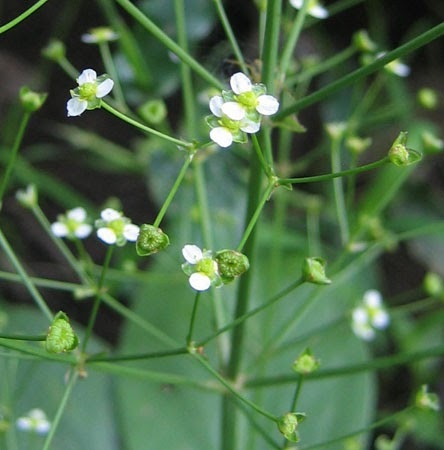 Each leaf has about 7 leaflets. ASIAN PHOTINIA: Leaves are alternate, and wider towards the tip. Little teeth along the margins of leaves. 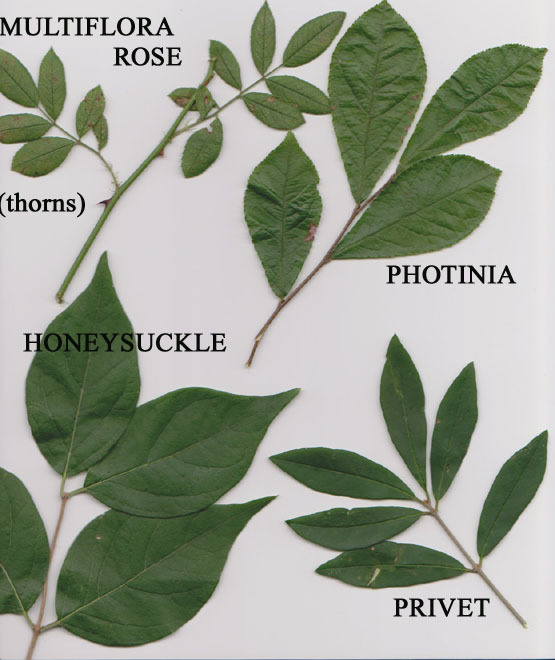 HONEYSUCKLE: Leaves opposite (come off stem in pairs), with graceful narrowing of leaves at tip. Leaf margins smooth. Bark is tan. PRIVET: Leaves are opposite, narrow, with smooth margins. Bark is grayish. One of my side specialties is reading palms, and after carefully looking at my life lines here, I came to the determination that I was about to be bitten by an Asian tiger mosquito. The story I heard is that it hitchhiked from Asia on a ship carrying old tires that landed in Florida, and has been moving northward ever since. 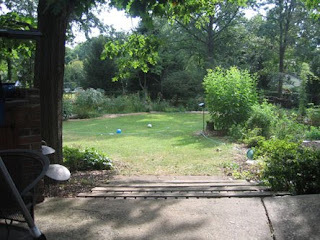 It was well established in North Carolina when I lived there, and has been in the Princeton area for a number of years. Note the striped abdomen, and you're likely to note also, much to your chagrin, that the tiger mosquito is very active during the day. 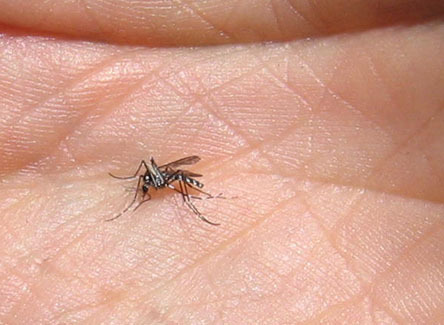 Native mosquitoes tend to become active only at dusk. 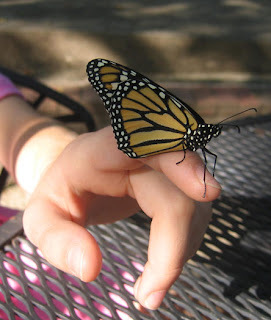 How does a kid end up with a beautiful monarch butterfly on her finger? It helps to have a wildflower garden in the backyard, or to have scoped out a patch of milkweed elsewhere in town. 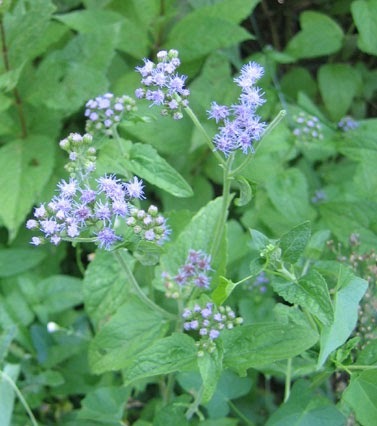 This backyard garden is planted with pickerelweed, Joe-Pye-Weed, boneset, and many other native wildflowers. Most importantly for the monarchs, it has lots of swamp milkweed. 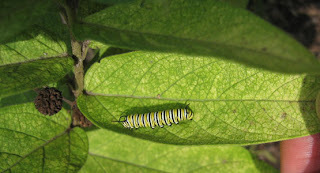 Monarchs will only lay their eggs on milkweed plants. 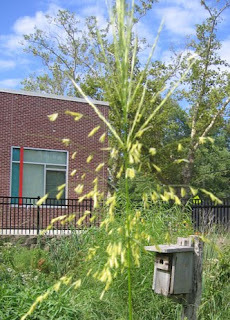 In Princeton, there are several kinds of native milkweed. Swamp milkweed grows in low, wet places. Butterflyweed, which has beautful orange flowers, grows in sunny meadows. Common milkweed is, not surprisingly, the most common. It's also the biggest, growing to five feet high or more, in fields and floodplains. 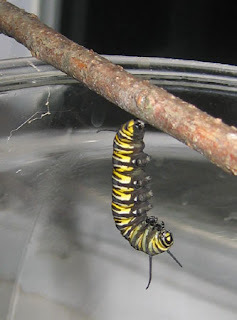 A glass fishbowl works well for housing monarch caterpillars. For documentary purposes, a camera, journal, and a cup of coffee for the grownup are handy. The bowl stayed on our kitchen window sill most of the time. 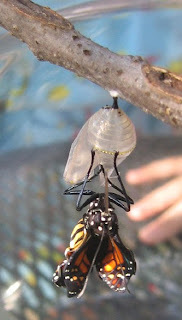 Monarch butterflies visit our garden every year, but in 2007 a female monarch came and left some eggs under the leaves of a swamp milkweed plant. The picture mostly shows a bunch of yellow aphids, which are tiny insects that drink the plant's juices. 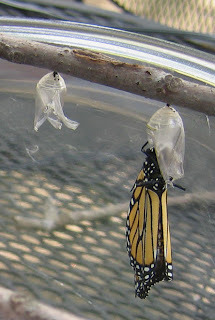 But at the top of the photo, you can see a tiny monarch caterpillar that has hatched from one of the eggs the monarch left. 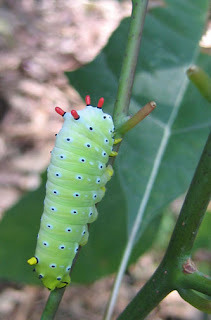 My daughters brought this and other little caterpillars inside, and fed them a steady supply of milkweed leaves. The bedding--folded paper towels occasionally moistened--needed to be changed every couple days because of the mess the caterpillars make with all their frass. One time, the caterpillars ran out of food, and one of them crawled down the hall into the family room. 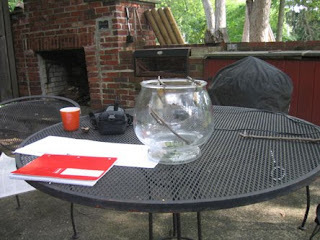 It helps to cover the top of the bowl with netting so they don't wander. 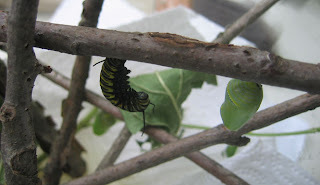 When a caterpillar has grown to full size, it will climb one of the sticks, attach itself to the bottom side, and go into a "J" position. It becomes very still, and overnight transforms itself into a beautiful green chrysalis with gold spots (on the right in the photo). It's really important that the caterpillar find a good spot to hang from, so that when the butterfly emerges, the wings can unfold and dry without bumping into anything. 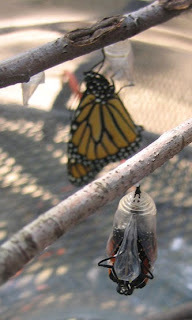 After a week or so, if you've been keeping an eye on the green chrysalis, you will see it start to change color. 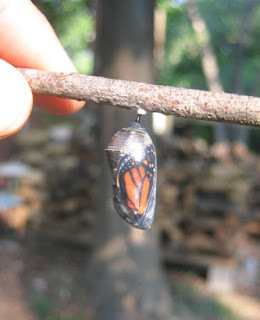 Before long, it becomes completely clear, revealing the butterfly that has been developing inside. There are two monarchs in this photo. The lower one is just starting to emerge from its chrysalis. the butterfly emerges, wings ready to unfurl. 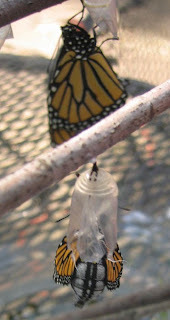 The monarch continues to cling to the remains of the chrysalis while its wings unfold and dry. This is a very delicate process, and any disturbance at this point risks deforming the wings. and take wing. From this backyard, the butterflies will head south to a mountain in Mexico, where they'll spend the winter clinging to trees on little more than five acres in a special forest. This miraculous journey is threatened. 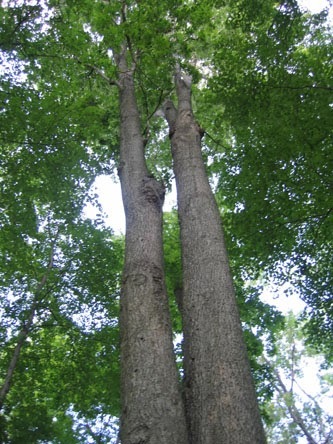 Logging is reducing the size of the forest where they overwinter. 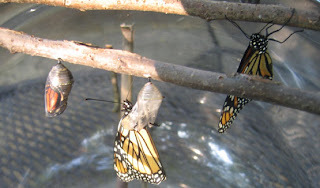 And as we continue to use fossil fuels, changes in climate leave the monarchs increasingly vulnerable to freak storms and other weather extremes. Or vice versa. 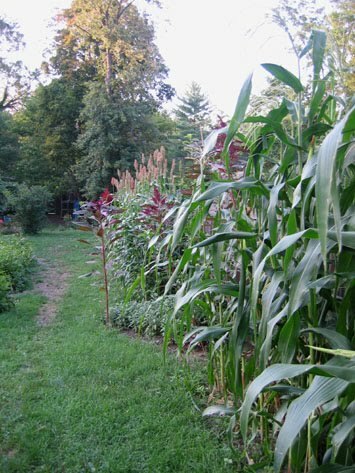 A friend of mine successfully disguised a fenceline this summer by growing tall grains along it--corn, amaranth and sorghum. 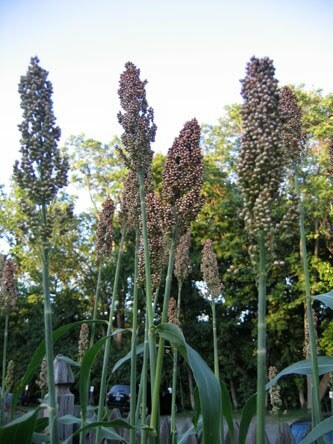 Sorghum looks like a corn plant with a different top. When I was in college, I made granola whose secret ingredient was sorghum, which came in a jar and was like molasses but lighter. 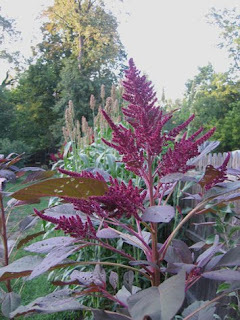 Amaranth is a genus of plants with a fascinating history and potential. An entry in Wikipedia tells of how it was grown for food by the Incas and Aztecs, then banned by the colonial powers, then recovered from wild plant populations in the 1970's. Being easy to grow and highly nutritious, it's seen as having great potential as "the crop of the future." Funny how the future can take forever to show up, though amaranth can be found in some breakfast cereals. The amaranth in the photo may be an ornamental variety. 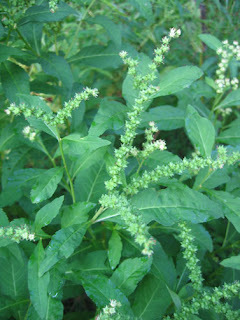 There are also various weedy amaranths, though I haven't seen them around here. I frequently saw pigweed (Amaranthus retroflexus) in gardens in the midwest, often growing with lamb's-quarters. 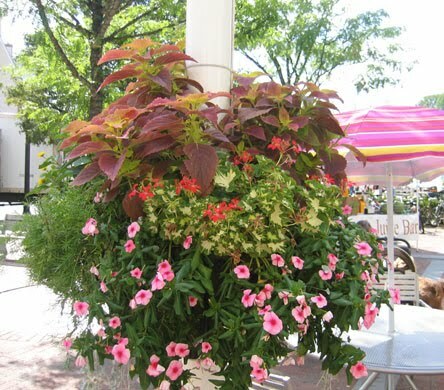 It's always a marvel to see beautiful plantings sustained year after year, particularly given the challenges posed by this summer's drought. The downtown plantings were initiated some years back by Polly Burlingham, and are taken care of by Polly and the borough. 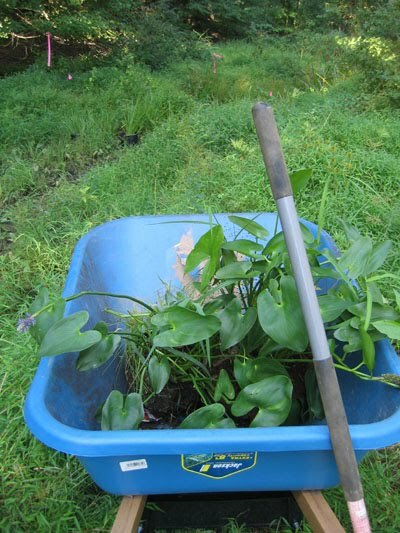 It sounds like the final dramatic episode in an epic battle, but these struggles against invasive plants usually end either in a draw or a whimper. Here, we're lucky to have a whimper. This bamboo bouquet (needs some aesthetic refinement) is about all that remains of the dreaded patch of bamboo that four years back was invading my yard from the north. 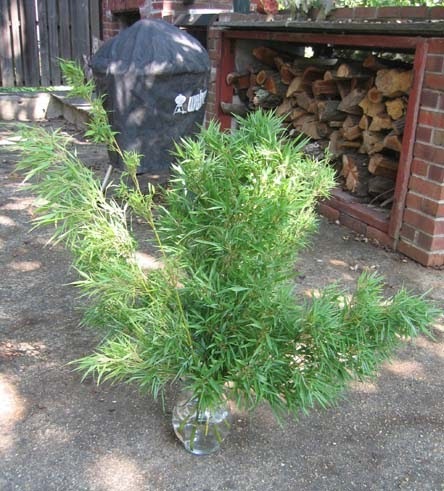 Periodic cutting down, with permission from my neighbor, of course, was all it took to tame the beast. With no leaves to provide new energy, the clone has to draw down its root reserves in order to keep metabolism going. It's important, though, to resist the urge to declare victory. A couple years of neglect would allow the bamboo to regain its strength. You can find previous posts about bamboo, or about any subject I've written about on this blog, by putting the relevant word in the search window on the upper left. 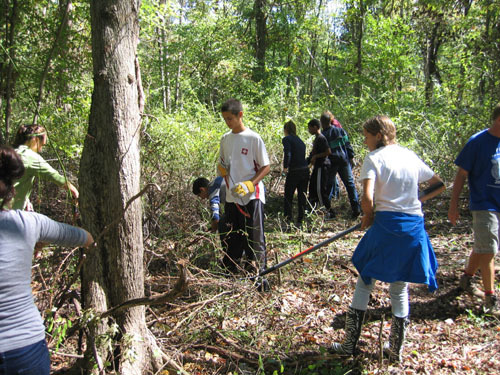 A few years back, I spent an afternoon with some of Tim Anderson's science students collecting bags of Indian grass seed in a location where annual mowing allows prairie species to survive. 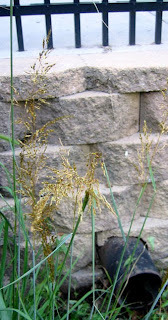 This is the same Indian grass that flourishes in tallgrass prairies out west. In Princeton, it's most common along the petroleum pipeline right of way that cuts across the Princeton ridge, and in the meadows at Tusculum. 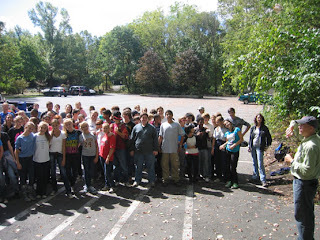 Tim wanted to get some growing in the high school ecolab wetland on Walnut Street. This is the first year they have grown up and flowered in significant numbers on some of the higher ground at the high school wetland. They have golden anthers that can be attractive in a subtle, hard-to-photograph sort of way. 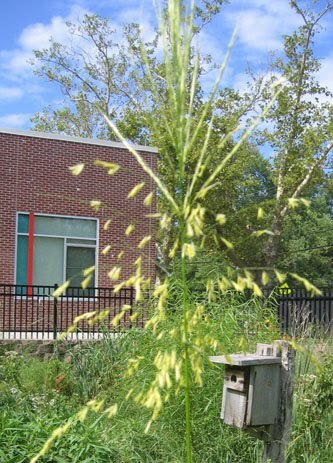 Another grass at the wetland, planted this spring and now flowering, is wild rice, which grows wild along the Stony Brook and at Rogers Refuge. Like corn, it's an annual that grows to remarkable size in one season. The wild rice, when combined with the cattails, Jerusalem artichoke, duck potato, elderberries and, for carnivores, the thriving crawdad population, is making the wetland look more edible all the time. This photo reproduces exactly what the flower head looks like when I have my glasses off. along with mistflower (Eupatorium coelestinum), which only grows to two feet high. It's ambitions are more horizontal than vertical, as it can get expansive and pushy if not surrounded by equally aggressive natives. Cardinal flower (red) and boneset (white) are likely no longer blooming when this is finally posted. If you visit the wetland now, the dominant color may be yellow, with tickseed sunflower and the native tuberous sunflower called "jerusalem artichoke" taking over the stage. This spicebush silkmoth (Callosamia promethea) is showing its appreciation of our work. Last year, we rescued some small spicebush from the lower dam of Mountain Lakes and transplanted them close to the greenhouse at Mountain Lakes House. After the effort to keep them watered through the long drought this summer, it's flattering that the caterpillar showed up to eat a portion of our fine crop. 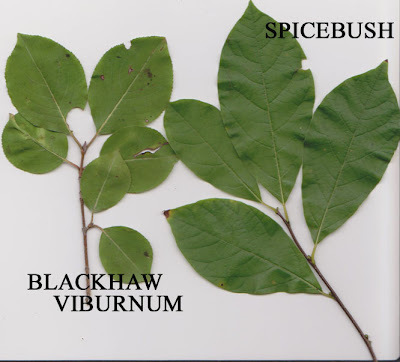 Spicebush, as is typical of native plants, gives a portion of its leaves to charity, which is to say it provides food for the native insects that specialize in consuming it. The spicebush swallowtail is another example. 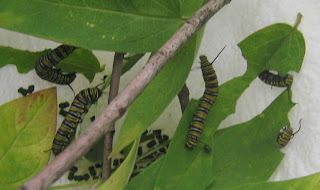 Thirty feet away, in a circular garden surrounded by the asphalt of the Mountain Lakes House driveway, is a more familiar caterpillar, the monarch, specialized to eat only milkweed species. In this case it's a swamp milkweed grown from local seed. Other insects are finding this oasis to their liking. 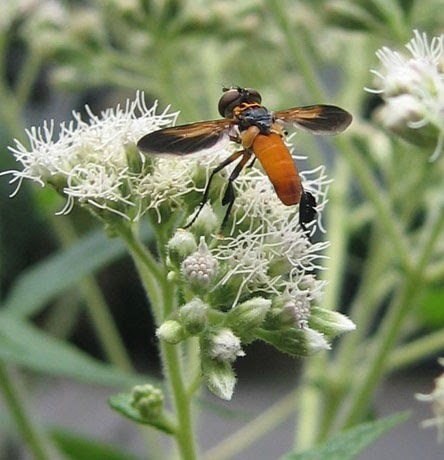 The last photo may be of a Tachina fly ( Trichopoda pennipes), frequently found on boneset this time of year.